Department of Conservative Dentistry and Endodontics, Darshan Dental College and Hospital, Udaipur. 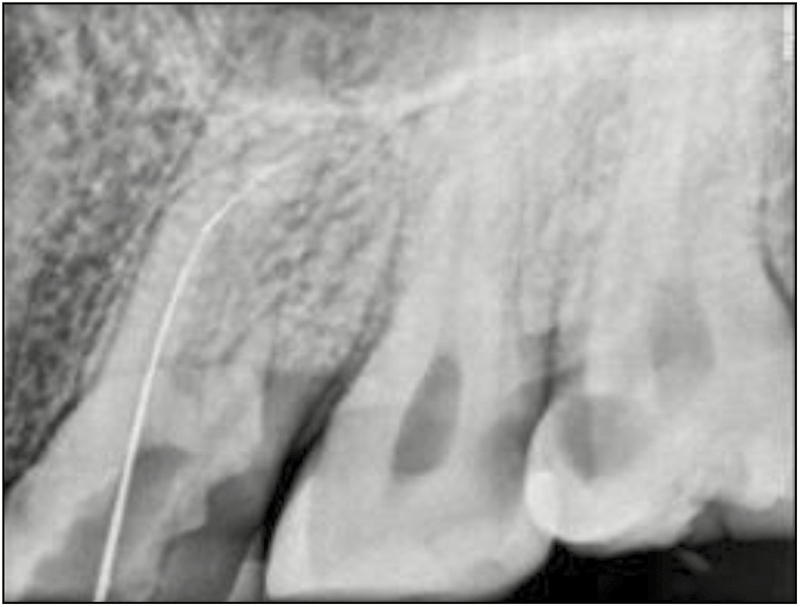 Separation of instrument in the root canal is a common mishap that occurs during the cleaning and shaping procedure. So many different methods have been developed to retrieve fractured instruments from root canal. 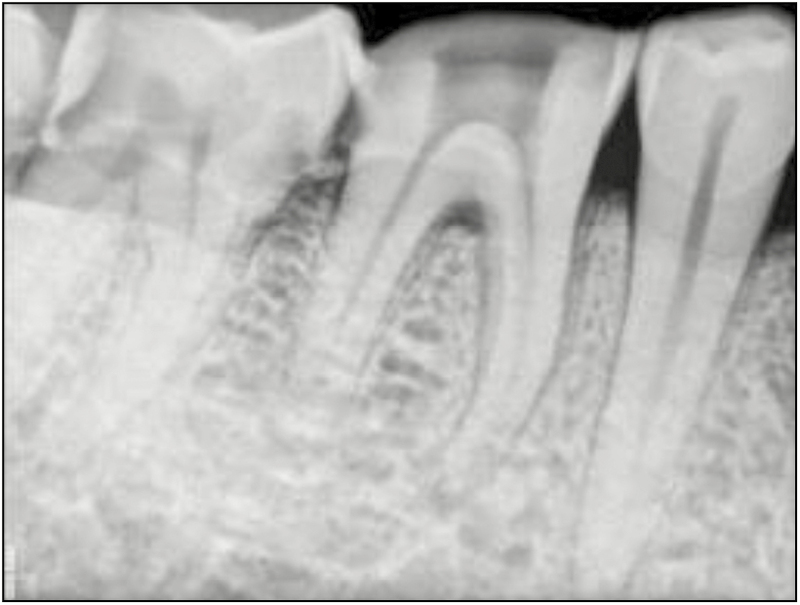 Separated instrument leads to incomplete cleaning of root canal and eventually causes posttreatment disease. For successful completion of treatment, a separated instrument must be retrieved and if not, a bypass must be attempted. 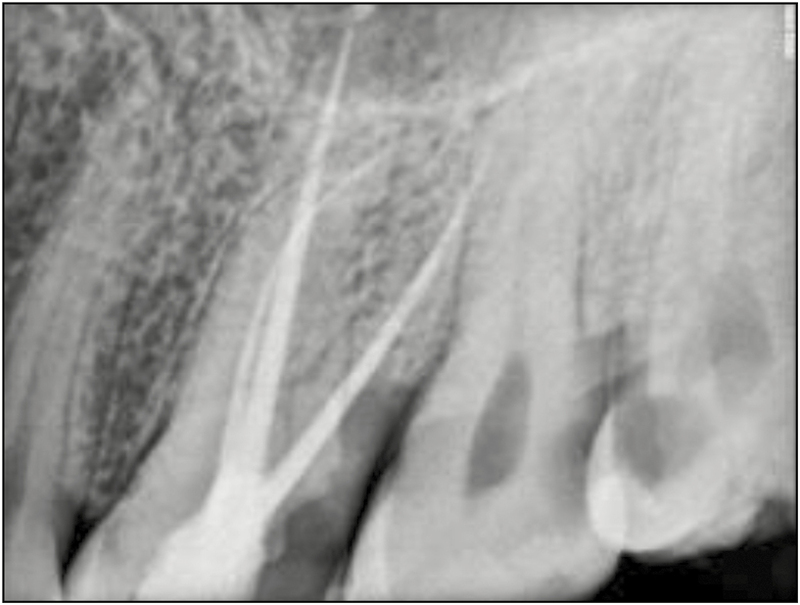 This article presents four cases requiring removal of separated instruments from the root canal. All four cases were successfully treated by conservative means of instrument retrieval by using two different techniques. One of the most distressing events during the course of endodontic therapy is the breakage of an instrument within the confines of the pulp space. The probability of separation of an instrument in a root canal during chemo-mechanical preparation has been generally reported as 2%–6% and by some authors as 0.4%–7.4% as well. 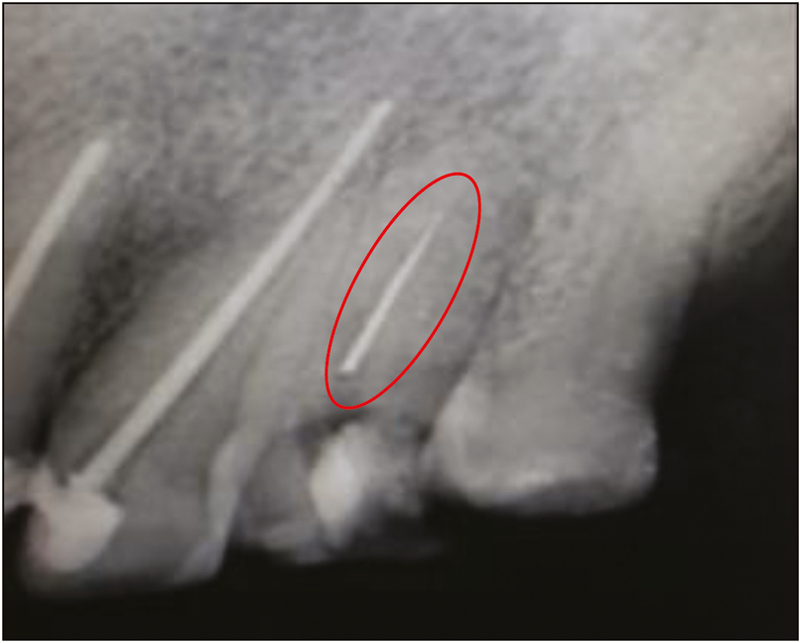 The commonly attributed causes of file separation are improper use, limitation in physical properties, inadequate access, lack of understanding of root canal anatomy, and possibly manufacture defects, however to be more specific, the fracture of stainless steel instruments is usually caused by excessive torque during instrument manipulation and that of nickel titanium rotary files by torsional stress and cyclic loading. A separated instrument prevents thorough root canal cleaning and shaping apical to level of separation and hinders the clinician from optimally preparing and obturating the entire root canal system. 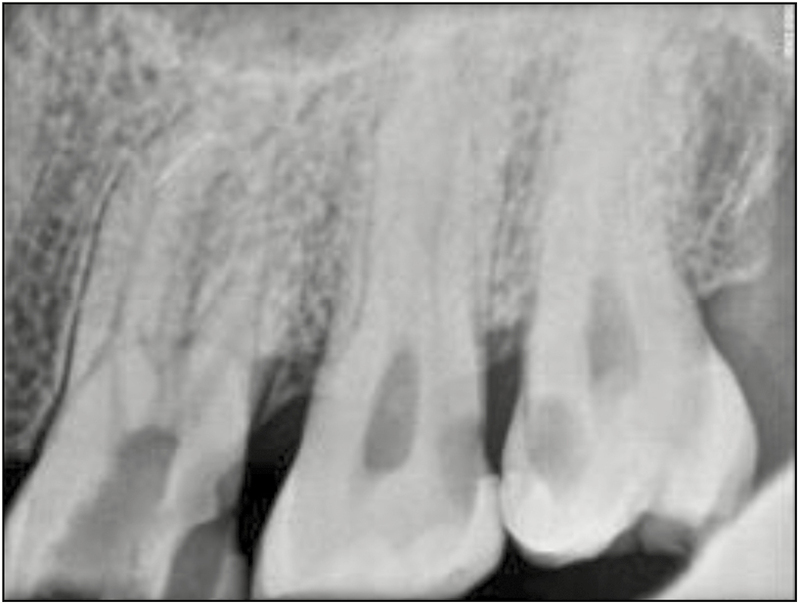 As a consequence to the operator’s inability to access the residual canal space, in cases of periapical pathosis with separated instruments, the prognosis of endodontic therapy decreases considerably. 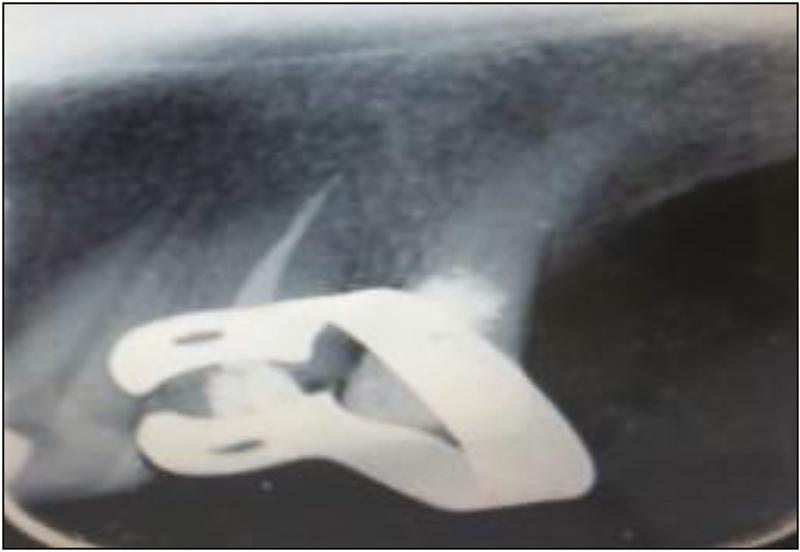 A 35-year-old man was referred to the Department of Conservative Dentistry and Endodontics, Darshan Dental College and Hospital (DDCH), Udaipur, Rajasthan, India, with an endodontic mishap in the form of instrument separation. Radiographic examination showed that instrument fragment was separated in mesiobuccal canal of the mandibular molar [Figure 1]. A straight line access was prepared by Kerr Corporation Orange (California, USA) using anticurvature technique. Placing a Hedstrom file (H-file) [Figure 2] down into the canal alongside, engaged with the separated file and activated by ultrasonic vibrations followed by simultaneous removal of both the H-file and separated instrument [Figure 3] after proper irrigation and canal preparation, obturation was carried out [Figure 4]. A 37-year-old man was referred to the Department of Conservative Dentistry and Endodontics with acute pain in the left upper back region for the past 3 days. Radiographic examination showed radiolucency involving pulp and according to treatment planning, root canal opening was performed. 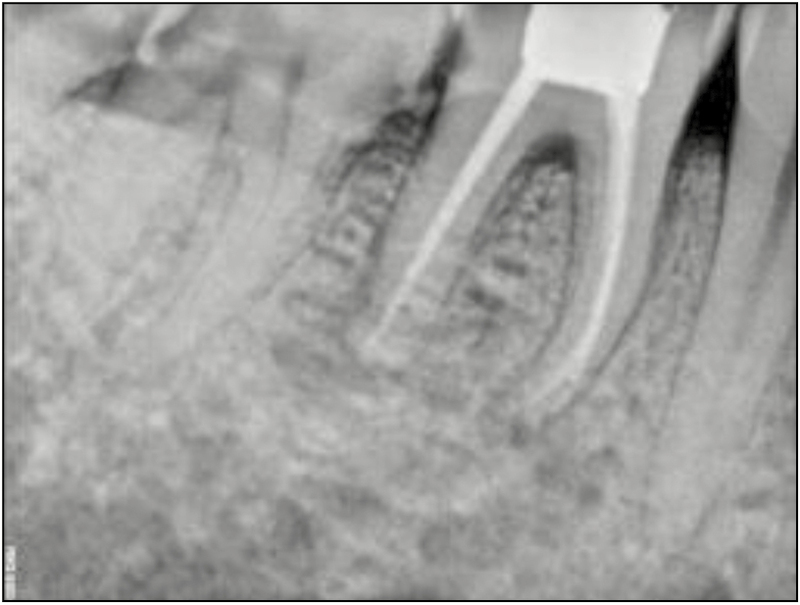 During canal preparation, file was separated at the apical region in mesiobuccal canal [Figure 5]. The file was then bypassed with help of ethylenediaminetetraacetic acid and K-file. Then H-file [Figure 6] was inserted alongside the separated instrument and ultrasonic vibrations were applied along the file and separated file was shifted in the middle of the canal [Figure 7], followed by retrieval of separated file [Figure 8] by braiding technique. After that, root canal treatment was completed by following the recommended protocol [Figure 9]. A 28-year-old man was referred to the Department of Conservative Dentistry and Endodontics with pain in the right lower back region for the past 4 weeks. 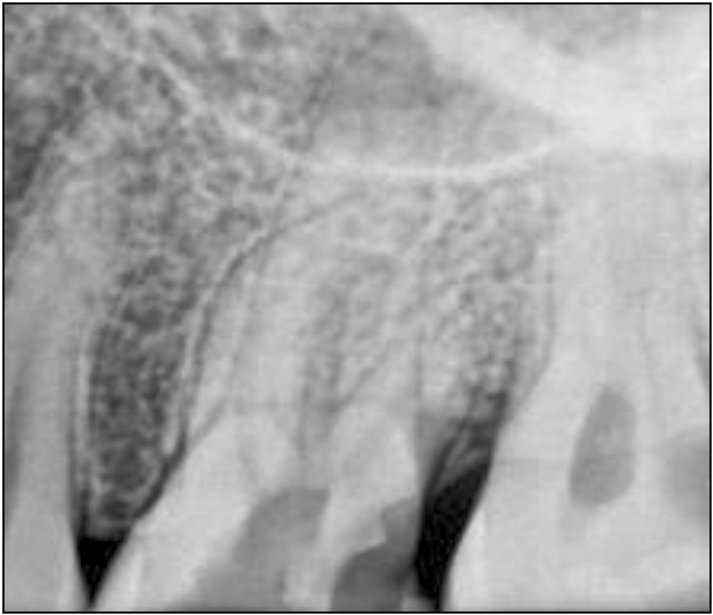 Radiographic examination revealed inadequate obturation with missed canal in 46 [Figure 10], and there were no periapical changes. After removal of obturating material, radiographic examination revealed that the instrument had separated at the junction of coronal and middle third of the canal [Figure 11]. Bypass the fragment and retrieval was done by braiding technique. In this technique, three Hedstrom no. 10 files were inserted down along the separated file in mesial, distal, and labial side and then twisted around one another to entangle the file and withdrawn in one stroke [Figure 12]. Confirmatory radiograph was taken to check the complete removal of file. 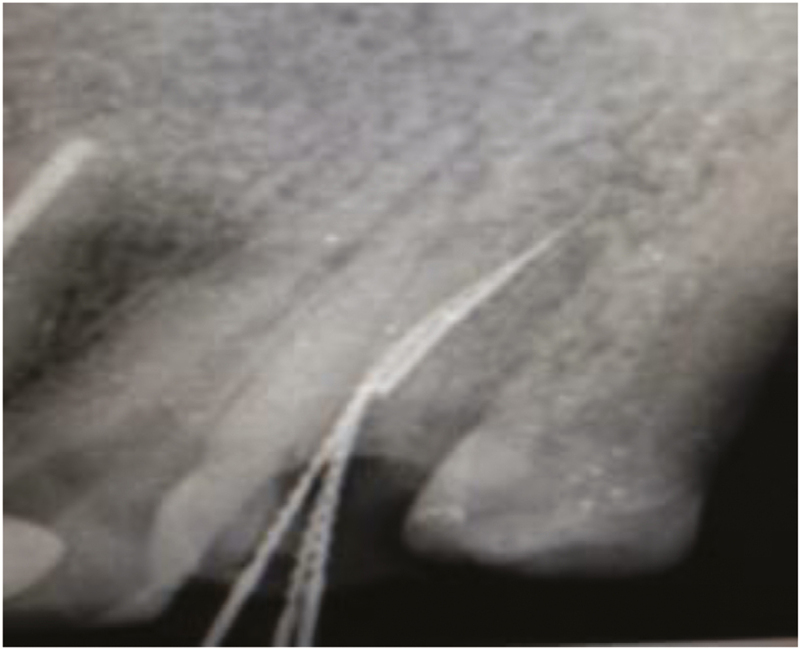 After 7 days, the patient was asymptomatic and the canal was obturated with laterally condensed gutta-percha using Acroseal sealer (Septodont), and the root canal opening was sealed using composite material (Synergy D6; Coltene, Headquarters: Altstätten, Switzerland) [Figure 13]. A 55-year-old man reported for endodontic retreatment of 24 in the Department of Conservative Dentistry and Endodontics, DDCH Udaipur. Radiographic examination showed a separated instrument in middle third of the mesiobuccal canalfigure [Figure 13] and [Figure 14]. It was decided to use the braiding technique for removal of separated instrument. Three H-files were inserted along the separated instrument as apically as possible from mesial, distal, and labial side, then twisted around one another to engage the file, and withdrawn simultaneously [Figure 15]. Subsequent to the removal of separated instrument, the canals were prepared and disinfected as per protocol. Patient was recalled after 7 days and the canals were obturated with lateral compaction method [Figure 16]. Obstructions in the canal, such as separated instrument, post, root canal filling materials, and silver points, should be removed for successful treatment. If they cannot be removed, they should be bypassed. 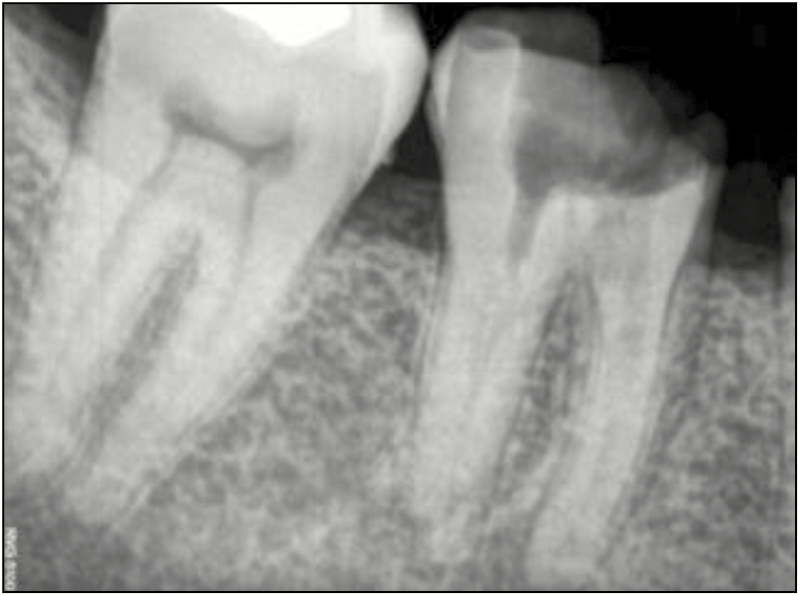 Separation of instruments compromises the outcome of endodontic treatment by preventing access to the apex and blocks the passage of irrigants to reach the apical level and it may reduce the prognosis of treatment., Cleaning and shaping below the level of separated instrument is generally not possible with endodontic treatment, they decrease the prognosis. Prognosis in this case depends on the infection in the canal, condition of periapical region, condition of canal below the separation (infected or not), and the level of separated instrument in the canal. Retrieval of the separated instrument or bypass leads to successful nonsurgical treatment or retreatment, which is a more conservative approach. 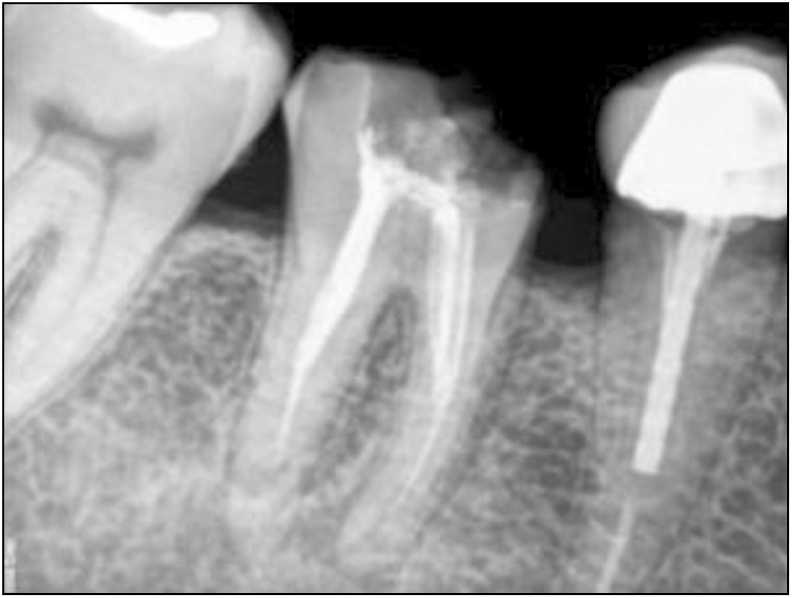 Instrument retrieval depends on diameter and cross section of the separated instrument, length of file, curvature of root, dentin thickness and morphology of the root canal, cutting action, length of instrument, location, and area of file binding to canal., However, the best prognosis occurs after complete removal of all obstructions. Different techniques have been described to retrieve the obstruction from canal including the Masserann kit (Micro-Mega, Besancon, France), the Endosicherheits system (Meisinger, Dusseldorf, Germany), the braiding technique, ultrasonics, the combined technique, the wire loop technique, and the endo-extractor technique., Retrieval of the obstruction by Masserann kit or the Endosicherheits system requires at least 1.2mm large access canal preparation. Such procedures have a high risk of perforating the root and reducing the radicular dentine. In this case, the separated instrument was first bypassed followed by instrument retrieval by braiding technique, considering the preservation of the radicular dentin. This technique consists of inserting multiple H-files and twisting them around the foreign body. H-files are preferred in this technique as their flute design is suitable for engaging the body. The braided multiple H-files would exert a gripping force that aids in the removal of the foreign body. The use of this technique has been reported in the endodontic literature. 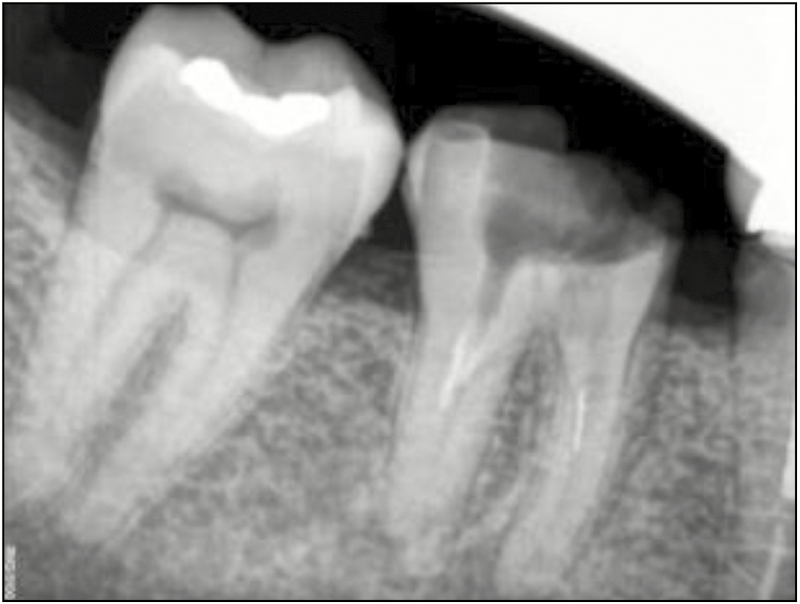 when incorporated judiciously along with the conservative techniques for the retrieval of fractured instruments not only give us the desired results but also save precious residual radicular dentin. Adl A, Shahravan A, Farshad M, Honar S. Success rate and time for bypassing the fractured segments of four NiTi rotary instruments. Iran Endod J 2017;12:349-53. Satheesh SL, Jain S, Bhuyan AC, Devi LS. Surgical management of a separated endodontic instrument using second generation platelet concentrate and hydroxyapatite. J Clin Diagn Res 2017;11:ZD01-3. Markose A. 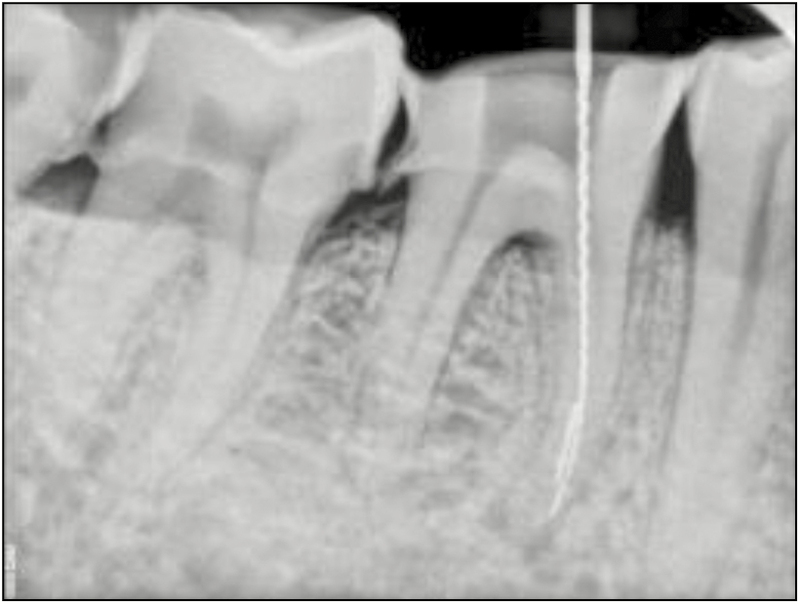 Management of separated instruments from the root canal—a review. IOSR 2016;15:43-7. Deepika G, Mitthra S, Anuradha B, Karthick A. Separated instruments—a mind-set between hard and rock: a review. J Evolut Med Dent Sci 2017;6:6077-80. Thirumalai AK, Sekar M, Mylswamy S. Retrieval of a separated instrument using Masserann technique. J Conserv Dent 2008;11:42-5. 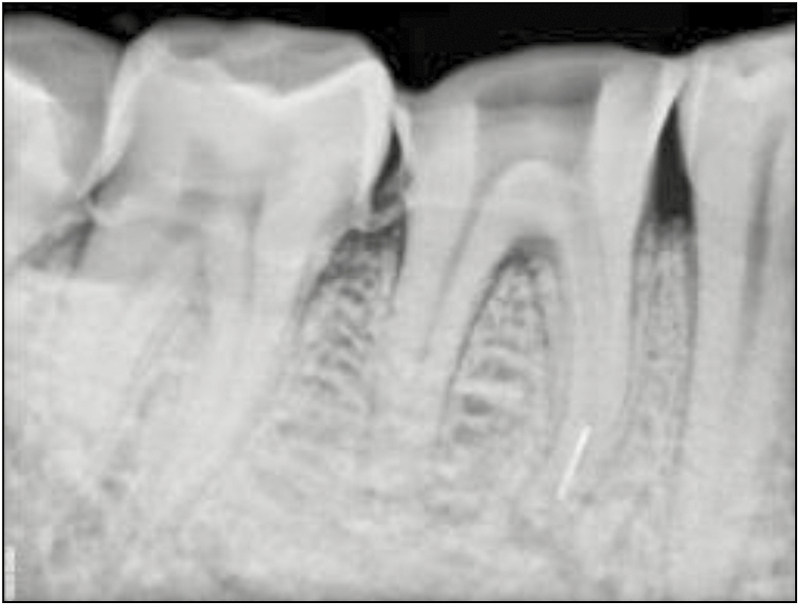 Tomer AK, Mini S, Bharadwaj G, Malik N. Broken file retrieval: puzzle in endodontics. IJOCR 2016;4:75-8. Nanhe S, Nanda Z, Reddy K, Agarwal AR, Murarka R, Patil N. Retrieval of A Separated Instrument Using Masserann Kit. Journal of Applied Dental and Medical Sciences 2017;3:64-8.
de Lange J. [Endodontic re-treatment or apical surgery, is an evidence-based choice possible?]. Ned Tijdschr Tandheelkd 2016;123:84-8. Madarati AA. Retrieval of multiple separated endodontic instruments using ultrasonic vibration: case report. J Taibah Univ Med Sci 2016;11:268-73. Yang Q, Shen Y, Huang D, Zhou X, Gao Y, Evaluation of two trephine techniques for removal of fractured rotary nickel-titanium instruments from root canals 2017;43:116-20. Brito M, Normanha JA, Camilo CC, Faria-e-Silva AL, Saquy PC, Ferraz MÃ, et al. Alternative techniques to remove fractured instrument fragments from the apical third of root canals: report of two cases. Braz Dent J 2015;26:79-85. Tewari RK, Kapoor B, Kuma A. Fracture of rotary nickel titanium instruments review article. JORR 2017;9:37-44. Singh C, Sharma D, Newaskar V, Agrawa D. A simple technique for removal of broken root tip of maxillary premolars: a technical note. J Maxillofac Oral Surg 2015;14:866-7. Malik G, Singh S. Tube and file method - a novel cost effective technique for broken instrument retrieval. IJDS 2016;10:137-44. Gutmann JL, Dumsha TC, Lovdahl PE, editors. 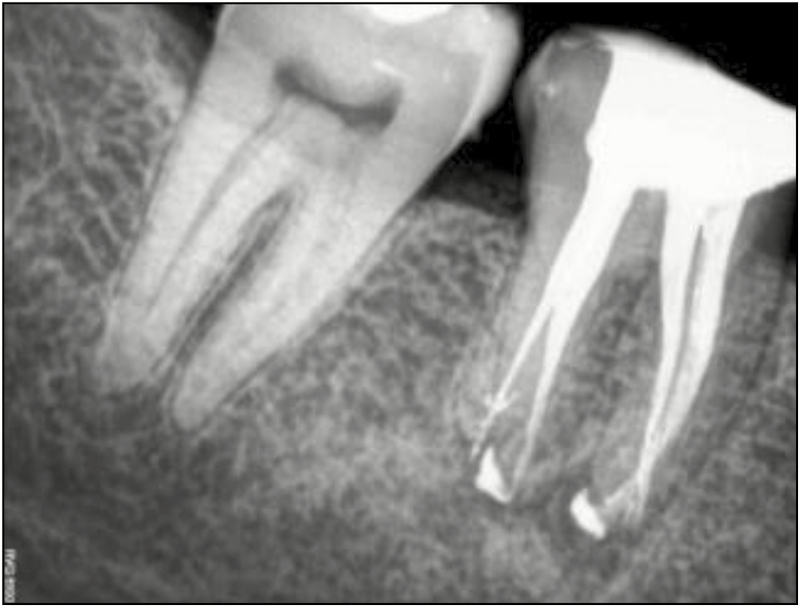 Problem solving challenges in the revision of previous root canal procedure. 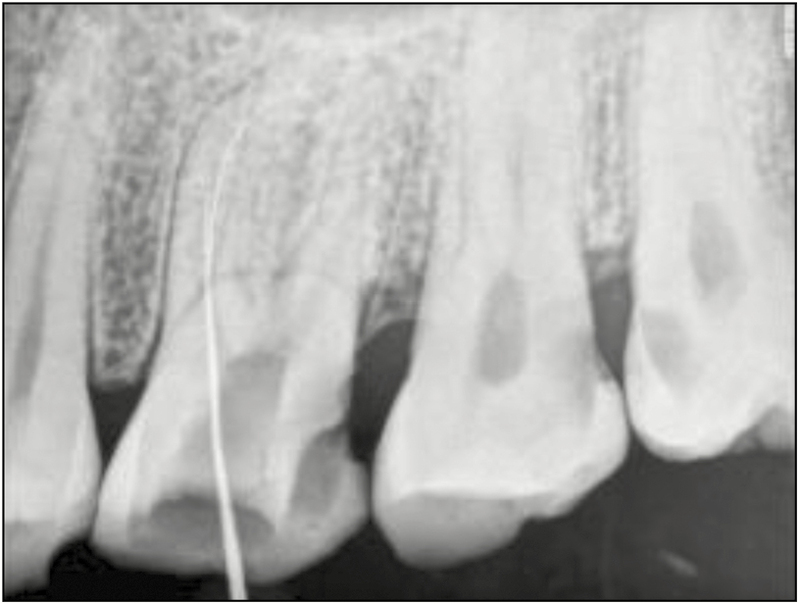 In: Problem solving in endodontics; prevention, identification and management. 4th ed. St Louis, MO: Elsevier Mosby; 2006. p. 239-79.